All herons tuck their necks in an "S" curve while flying and lack the long, fluffy tertials and red crown. The very rare Whooping Crane is white overall with black primaries and a different head pattern. With its huge size and white plumage, the Whooping Crane is unmistakable at close range. In flight, similarly white egrets tuck their necks in an "S" curve while flying and lack the black primaries. Sand hill Crane is similar in shape but is gray overall. 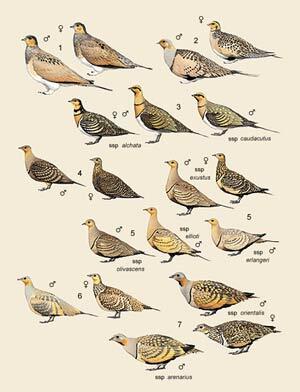 The Pin-tailed Sandgrouse is typically a bird of open treeless plains. It is about 30 cm.long with sharpened central pens of the tail, white belly, inferior part of the white wing with black end Male: in summer, superficially brown grayish, speckled of yellow; black chin and throat, wrap pectoral chestnut Female: In winter, both have similarities and more extinguished colors. Incubation: By both parents, of about 21 days.The chickens leave the nest soon after being born. The mother brings the water to them in the soaked pens of the chest. Uncultivated scrubs and grain fields.Other sub speices are the black bellied sandgrouse (petrocles orientalis) and the spotted sandgrouse ( pterocles senegallus).